The staff of the Student Legal Service consists of three full-time attorneys and one full-time office support person. There may be one or more part-time law student interns from the University's College of Law who work under the supervision of the attorneys. 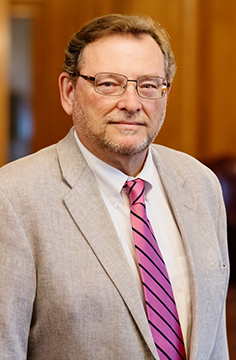 Thomas E. Betz is the Directing Attorney for the office and began as a staff attorney at Student Legal Service in January, 1986. Betz is a 1981 graduate of Wayne State University Law School, a member of the Illinois Bar, and formerly a member of the Michigan Bar. He is a member of the Champaign-Urbana Tenant Union Community Advisory Board, and was involved in the drafting of the Urbana Landlord-Tenant Ordinance. Mr. Betz was an elected member of the Champaign County Board from 1996 to 2012, and served as Vice Chairman of the Board; Chairman of the Policy, Appointments, and Procedures Committee; and was a member of the Facilities and the Labor Negotiations Committees. Betz is, and for many years has been, the Chair of the "Elizabeth Berg Streeter Community Service Award" committee of the National Legal Aid and Defenders Association — Student Legal Services Section. In 2013, to his surprise, he was presented with the award, himself. He is also an active member of the University Student Legal Service Association -Western Region and the Triple I Student Legal Service Region, and a member of the American Immigration Lawyers Association and the National Association of Criminal Defense Lawyers. He was selected to receive a prestigious Chancellor’s Academic Professional Excellence Award in 2016 at the University of Illinois. Susan Y. Hessee, a 1982 graduate of the University of Illinois College of Law, has been a staff attorney at Student Legal Service since March, 1988. Hessee is a member of the Illinois and Michigan Bar Associations. She is an active member of the National Legal Aid and Defenders Association — Student Legal Services Section, University Student Legal Service Association -Western Region, and the Triple I Student Legal Service Region. She is active with the Champaign County Bar Association, Health Care Consumers, Planned Parenthood, and the American Civil Liberties Union. A member of St. John the Divine Episcopal Church, she is member of the choir and serves on the Discernment Committee. Mary Ann Midden became a staff attorney with the office in February 2008. She graduated from Southern Illinois University at Carbondale’s Law School in 1979. She started working with students while an Assistant City Attorney for Carbondale for four years and subsequently continued while an Assistant City Attorney for Champaign from 1985 to 1994. While working with municipalities and in private practice for over 30 years, she gained experience handling misdemeanor and traffic tickets as well as housing complaints, landlord complaints, discrimination and harassment disputes, contract law, consumer issues and mental health issues. She is currently an active member of National Legal Aid and Defenders Association — Student Legal Services Section and University Student Legal Service Association – Western Region, President of the Triple I Student Legal Service Region, and a member of the National Association of Consumer Advocates. A recent research project on issues students were having with repayment of Federal Student Loans became a formal presentation, "How to Reduce or Cancel Your Federal Student Loan Payments," which is available in the presentations section. More recently, new Illinois laws have been summarized in two presentations, "Medical Marijuana in Illinois" and "Possession of Marijuana for Personal Use", which are also available in the link above.